Registration reserves your space and will be refunded following the Chili Cook Off if contestant participates in the event. Read the Chili Cook-off Info Form - pdf. Fill out the Chili Cook-off Registration Form - pdf. Individual contestants or teams are welcome to participate. On-site contest: All contestants must cook everything on-site. Judges are from the local Restaurants, Politicians etc. People's Choice award: Festivalgoers can purchase a chili sampler and ballot for $8. (All monies collected from chili sampler will be donated to the Festival at Mt. Si). At approx. 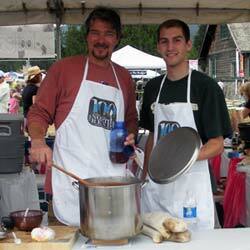 1:00pm paying Festival goers will receive 2 oz of chili from each contestant booth/table. Restaurants or professional kitchen teams not allowed. All preparation of ingredients and cooking is on site only (NOTHING can be pre-prepped or preportioned i.e. chopped onions, meat cutting, spices, special sauce unless commercially canned or bottled i.e. catsup, tomato sauce -- think Heinz). Pre soaking beans must be done on site or canned beans can be used. No electrical outlets will be available! 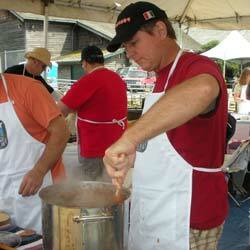 Meet at Chili Cook-Off tent on Sunday from 8:30am but no later than 10:00am for set-up. All chili ingredients specific to your recipe including spices, meat, beans, onion etc. Contestants must provide cooking and storage equipment including cooler(s) w/ice, stoves, propane burners, cooking thermometer, pots, towels, cooking utensils; spoons, knives cutting boards etc. No food handler permits required by contestants. A great "sense" of organization.... and humor and The PRIZE MONEY! Event set-up and management including tables, tenting, signage, hand washing area, ballots, etc. Paper and plastic products for distributing to the Judges and Public.